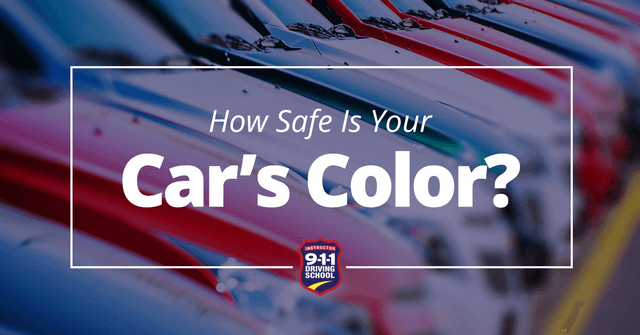 Home > Blog > Uncategorized > How Safe is Your Car’s Color? How Safe is Your Car’s Color? From air bags to back up cameras, cars are coming with more safety features than ever before. Potential car buyers always have a preference on the color of the car, but to what extent does the car color influence its safety? Whether it is correlated or causation, here are three reasons color does make a difference in driving. Position of the sun. If a driver is dealing with glare on the windshield, it’s hard to see any color of car. Distracted driving from kids, cell phones, and eating in the car. Road rage from yourself and those around you. Impaired driving with alcohol, medication, or health conditions. Being in a hurry to get to your destination. Driving a white vehicle does not protect you in any of these scenarios. When it comes to other drivers seeing you, one Australian study showed that having a white or brighter colored car could give a driver 10% more visibility during daylight hours. Citing studies by the federal government, the Institute for Highway Safety says that day time running lights give every vehicle another small bump in visibility on the road. Having a white vehicle with day time running lights means that when it comes to being spotted, you have the best chances. Darker colored cars are considered more dangerous because of the level of damage they tend to have to the body. This isn’t necessarily true though. Darker cars tend to show more damage on the body after any kind of incident. Scratches on any color vehicle are typically white, making it less obvious on a white car than a black one. Basing a safety rating from visible damage to the car’s body isn’t the best way to form an opinion. Speaking in generalities, the color of the car usually reflects the personality of the driver. People who own a bold colored car often have bold personalities. Drivers with a bright orange, pink, or neon shade of green want to be noticed, while those who prefer white, silver, black, or beige are usually more mellow. Sports cars are also a flashy style of car that people just tend to drive faster in. Drivers who like to go fast are going to get in more traffic incidents than those who are more cautious. If you choose a white car because you believe it is safer, chances are good that you have a safe personality and take precautions in driving anyway. While the color of your car does play a part in safety, it isn’t the ultimate factor in most traffic collisions. The best way to avoid incidents is to practice your safe driving techniques. Give yourself plenty of time to get where you need to, obey traffic laws, pay attention to the road, and be a defensive driver. These all increase your chances of staying safe on the road. Help be a part of the solution! Driverless Cars: Will People No Longer Need to Learn to Drive?